Travellers’ community, Westway. Photo © Dave Hendley 1972. The picture was made one Saturday in the late summer of 1972 at the other end of my working life and in a very different world. I was on a job for Time Out and the mission was to photograph a free music festival in what was then a grassed area under the Westway by Latimer Road. My brief was to photograph stock pictures of musicians for future inclusion in the magazine’s gig guides. The concert was a small and very comfy affair with an audience of around 150 – 200 people. 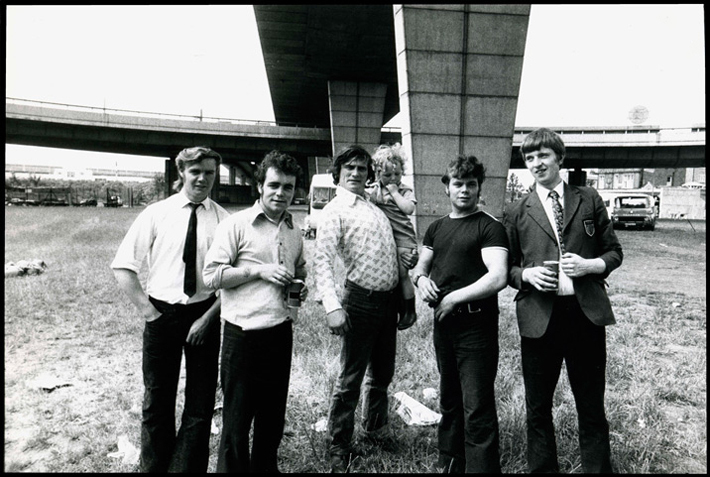 A short distance away, under what is now the West Cross interchange, there was a cluster of caravans and I spotted a group of traveller men-folk observing the event with curiosity and great amusement. I wandered over and asked to take a photograph. These were times when being photographed was something of a compliment and the lads posed willingly. I suspect in today’s suspicious climate I would have met with a more hostile reaction. I took just two frames as was my normal procedure back then, film was a precious commodity and consequently I always shot very concisely. After all why would you want more than one or two shots of a particular subject? Later in the afternoon the Time Out picture editor Rebecca John (the granddaughter of the painter Augustus John) came to say hello and I abandoned my duties for a visit to a nearby pub. Rebecca was a very lovely person and it is is one of my great regrets that we subsequently lost touch over the years. I returned to photograph a few more bands, including a musician called Steve Hillage, a strange hippie type in a pixie hat. As I was shooting away a scruffy but very polite and gently spoken young man approached me and enquired if he could buy some pictures. He wrote his name, Richard, and contact details on the back of a crumpled flyer. On the following Monday I made my way to the Virgin shop in Notting Hill Gate where I sold Richard Branson a couple of frames for a tenner.